The Federal Trade Commission publicly confirmed on Monday that it was investigating Facebook as a result of the Cambridge Analytica scandal. Facebook has been in hot water after news reports revealed that Cambridge Analytica had illicitly obtained data on up to 50 million users that it used to target voters during the 2016 US presidential election and during the Brexit vote. The FTC previously looked into Facebook’s privacy practices several years ago and found them wanting. In 2011, Facebook entered into an agreement with the FTC that regulated how it treated its users’ privacy. 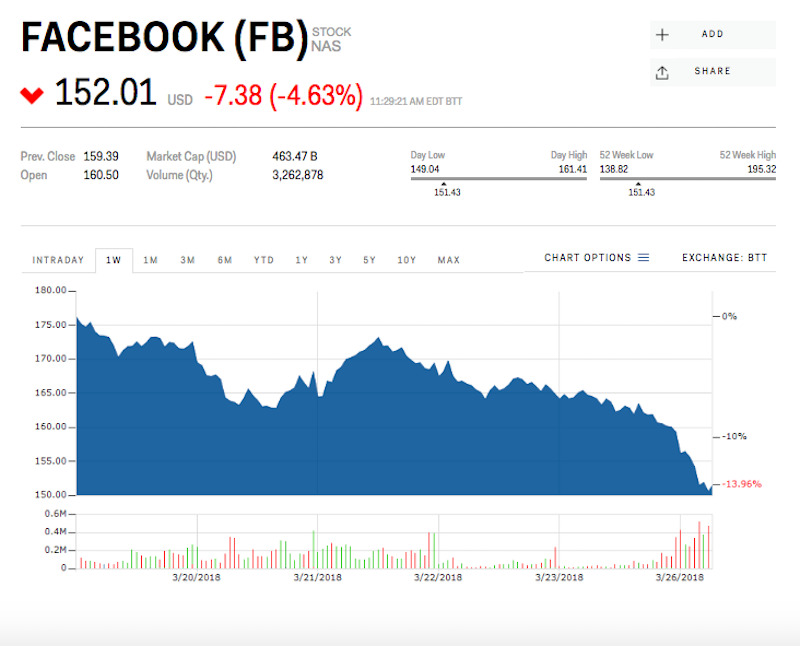 The Federal Trade Commission on Monday publicly confirmed it was investigating Facebook after several news outlets reported on the investigation last week. Facebook stock was down as much as 5% on Monday after the news broke. Facebook has attracted the FTC’s scrutiny over the Cambridge Analytica scandal. Cambridge Analytica is a British political-marketing firm that illicitly obtained data on up to 50 million Facebook users that it used to try to influence voters during the 2016 US presidential election and the Brexit vote. It isn’t the first time the FTC has investigated Facebook’s privacy practices; the agency looked into the company’s practices several years ago and found them wanting. In 2011, Facebook entered into an agreement with the FTC that regulated how the social-media company treated its users’ privacy. With this latest investigation, the FTC will be looking at whether Facebook violated that agreement and whether it violated any FTC regulations more broadly in its dealings with Cambridge Analytica. The Cambridge Analytica scandal has prompted some, including powerful people in Silicon Valley, to call for regulation of Facebook and perhaps other internet companies. At the same time, more is being revealed about just how much data Facebook has been collecting on its users, including in new reports that it had tracked some Android users’ phone use. Here’s the official statement confirming the FTC’s investigation. It mentions Privacy Shield, a framework between the US and Europe for how personal data must be treated by tech companies when it travels between countries. Investors were not happy with the latest news.